CES 2014 is underway in Las Vegas! Covering the show this year is our veteran team: Robert Kozel, Chris Heinonen, Piero Gabucci and Stephen Hornbrook! And of course Cynthia Johnson, Managing Editor and John Johnson, Editor-in-Chief are on the ground as well. This year is no different than past years, with respect to the multiple venues to cover, but it does seem that the off-site meetings in hotels other than the main venues are increasing, so getting to all of the great new products in audio and video is getting to be a race. And this year is full of travel challenges for those travelling from the East and Midwest…. Coverage will begin tomorrow, here, but do check out the real-time postings on Google+ all week. Primary audio and video coverage will be from the Las Vegas Convention Center and the Venetian Hotel. Also planning some coverage of THE Show, later this week. 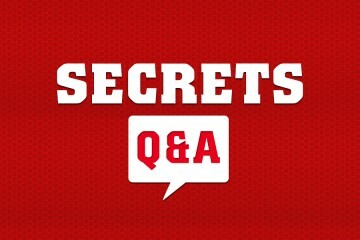 This is the 20th Anniversary for SECRETS of Home Theater and High Fidelity and SECRETS has been covering CES for all of those years……..Most of the SECRETS Show Reports are still in the Archives, if anyone wants to take a little trip down memory lane. High-End Audio was at the Sahara, which was torn down about 1996 and the LVCC housed the video and car audio and alot of the speakers and receivers and subwoofers. In the 1997 CES report, John Johnson made a comment about how the show was really spreading out……..sure could not have imagined the CES of today! I started my day at the Las Vegas Convention Center with a very quick visit to the North Hall. I typically don’t get time to visit this hall which has a lot of the automotive technology and countless companies showing accessories for phones and tablets. Even in the North Hall there were companies showing the ever-popular headphone. Here are some products from California Headphone. While we don’t cover the car audio world, there was an incredible array of audio products to turn your vehicle into a mobile dance club. Here is just a quick sampling of two of the amazing cars on display. I hope they come with ear plugs. The Pioneer booth had the flagship Elite SC-79 AV receiver on display. The SC-79 was a CES 2014 design and engineering honoree. You see many companies at CES trying creative approaches to get your attention. Check out this display. It looks like something out of a Bond movie. I made my way over to the Central Hall and was amazed at the throngs of people. The crowd at the Venetian had seemed particularly light the last two days with so many people being delayed due to the arctic freeze earlier in the week. The shoulder-to-shoulder crowds at the LVCC were intense and popular booths like Samsung and LG were very difficult to get around. Here’s a look at the Samsung floor. On the audio side of things, Sony was highlighting their high-resolution audio products. Here is the NWZ-ZX1 high-resolution Walkman. It features Sony DSEE HX (Digital Sound Enhancement Engine) processing which upsamples incoming signals to near high-resolution quality. The NWZ-ZX1 supports 24-bit/192 kHz high-resolution audio formats such as FLAC and it will support DSD. Pricing and availability are yet to be announced. Sony was featuring live performances by Elaine Faye and the Big Bang to showcase high resolution audio recording. Sony was recording the live performances on the Sony PCM-D100 linear PCM recorder which retails for $999. The PCM-D100 is one of Sony’s professional recording products and it records in linear PCM at 24/192 kHz and DSD at 2.8224 MHz. After a live three-song set by Elaine Faye and the Big Bang, the audience was invited to come into an adjoining room and hear the same performance played back from the DSD file recorded by the PCM-D100. The file was played using Sony’s HAP-Z1ES high-resolution audio player. I have to say that the demo really left something to be desired. Elaine’s vocals were drowned out by the sound of her band, and it really didn’t sound like the performance that I had just heard. When I asked about that, I was told that I wasn’t listening to the performance that just took place but rather to a recording that had been made earlier in the week. While I can understand not wanting to have any technical difficulties in a demo, I felt that Sony was cheating the audience with this approach. The Sony rep handed me a PCM-D100 and a pair of headphones and I was able to listen to the recording of the performance that I had just heard. I was pleasantly surprised to hear Elaine’s great vocals coming through as I remembered them. Sony was also showing their UDA-1 USB DAC amplifier. It supports the DSEE processing engine and supports ALAC, FLAC, LPCM up to 24/192 kHz and DSD 2.8 MHz and 5.6 MHz. Sony was showing the PHA-2 portable amplifier. It supports ALAC, FLAC, LPCM up to 24/192 kHz and DSD 2.8 MHz and 5.6 MHz. The PHA-2 has three USB inputs and features a high quality PCM1795 DAC. The PHA-2 will retail for $699 and will be available in March. The Moneual booth was very creative and featured lots of personal robots to keep your home clean. A major theme at the show was connectivity to your automobile. Samsung was showing Galaxy Gear watches that interfaced with the BMW i3. The same type of connectivity was also being shown at the Intel booth. The stars of the show were the stunning 4K UHD displays like this 85″ beauty from Samsung. Here is a gorgeous 98″ 4K IPS display from LG. Just in case you had any doubts that 4K would be immediately followed by 8K, here is a 98″ 8K (QUHD) display from Samsung. There were numerous booth displays addressing the concern of available content for your 4K television. Sony highlighted that Netflix would be streaming in 4K in the first half of 2014. Sony also highlighted working with YouTube on delivering 4K content in Google’s VP9 video compression format. Samsung was showing some pretty amazing upscaling technology on their UHD displays. In this demo, you could almost make out the book titles in the upscaled image. The whole goal of the technology is to make sure your existing content can look great on that new 4K UHD television. While all the major players like Samsung, LG, Sharp, Toshiba and Panasonic had 4K UHD, OLED and curved televisions on display, there was also plenty of competition from other brands like HiSense, Konka, and Changhong. In case you don’t recognize the name, Changhong is a major Chinese electronics company that was founded in 1958. The curved televisions were beautiful but I am not convinced that it is the right solution for every room. The argument is that the curved displays provide a more immersive viewing experience. It definitely depends on screen size and seating position. With these 105″ 21:9 panoramic televisions from Samsung and LG, an immersive picture should never be a problem. As I was leaving the LVCC, this vintage Crosley convertible coupe caught my eye. Crosley was showing their lineup of portable turntables. Many models would not only play your vinyl but let you record from vinyl to digital via USB. After a very long day, Piero, Cynthia and I enjoyed a fantastic meal at Brand Steakhouse at the Monte Carlo. The steaks were Tomahawk ribeyes and they were worth fighting over. The Vitus Audio suite was using this gorgeous red Da Vinci DAC from Light Harmonic. The Da Vinci DAC was used in many of the high-end rooms this year. The Vitus Audio demo room was also using the Sinfo power distribution unit (a.k.a. power strip) from Fono Acustica. The power strip’s conductors are made from precious metals. The Sinfo retails for $10K. AVM-TEC was showing the Alluxity Pre One preamp. The Pre One features five inputs, two outputs, and a dedicated bypass output. The Pre One uses two gain stages per channel and uses a relay-based volume control. The Pre One is modular in design allowing for future upgrades. Krell was showing their new iBias high-efficiency Class A amplifiers. Krell says the iBias technology eliminates crossover distortion allowing for performance that rivals a traditional Class A amplifier while being more energy-efficient than Class G and H designs. The iBias circuitry monitors the amplifier’s output transistors and instantly adjusts the power (or bias) based on demand. This results in much less power being wasted and it reduces heat. The Krell Chorus amplifier is 200W/channel and comes in a 5 channel version for $7,500 and a seven channel version for $9,500. The Krell Solo monoblock amps come in two models. The Solo 375 is 375W for $8,750 and the Solo 575 is 575W for $11,250. The Krell Duo is a two channel amplifier and it also comes in two models. The Duo 175 is 175W/channel and the Duo 300 is 300W/channel. Krell also built-in network monitoring and control into the new amps. This allows a customer or dealer to monitor the amp and check things like channel temperature and fan operation. Krell was showing a simple iPad app to monitor the Duo 300 in the demo room. Kharma International was showing the new Kharma Elegence DB11-S speakers which won an innovation award for design and engineering at CES 2014. Focal was showing their new Dimension sound bar and subwoofer system. The Dimension has five ultra-thin speakers which allows the sound bar to have a very shallow depth. The optional subwoofer can be used as a stand for the display. The Dimension sound bar and subwoofer deliver 450W/channel for a 5.1 speaker system. The Dimension sound bar lists for $1,199 and the optional subwoofer is $499. Here’s some beautiful gear from PrimaLuna. Antelope Audio was featuring renowned Audio Mastering Engineer Doug Sax as a guest speaker. Doug was gracious to share some of his insights into the history of the recording industry and into the resurgence of vinyl records. Doug is the CEO of The Mastering Lab which is entering its 47th year of business. The Mastering Lab will be releasing a series of limited edition LP records of music from their choosing which will represent all that the vinyl format has to offer. The limited edition records will be pressed at Chad Kassem’s Quality Record Pressing facility in Salinas, Kansas. Antelope Audio had the Rubicon on display. The Rubicon is a 384 kHz digital audio preamplifier with a Rubidium atomic clock. On top of the Rubicon is a gold-plated stepped-relay volume-attenuator which provides very accurate stereo balance at low volumes. Antelope Audio is now shipping the Zodiac Platinum DAC and Voltikus power supply. The Platinum DAC uses an ultra-low jitter USB for streaming up to DSD128 and 384 kHz PCM. The Platinum DAC also upsamples lower-rate DSD to DSD256. The Zodiac Platinum DAC retails for $5000. This is the new A6 speaker from Angel Sound which took three years to develop. A pair will cost you $65,000. The S8 speakers from Angel Sound can be ordered in your favorite color. This beauty is the prototype of the new Dan D’Agostino integrated amplifier. Pricing is estimated to be around $45,000. The integrated amplifier’s internal components are connected to a thick layer of copper which is then sandwiched against a layer of aluminum to create a gorgeous and extremely functional heat sink. Estelon was showing their X Diamond speakers which are $69,900/pair. They were powered by Chord Electronics SPM 14000 monoblock amplifiers which are $86,000 each. Here’s the Chord Electronics CPA 800 preamplifier which retails for $45,000. Silverline Audio was showing their Bolero Supreme ($15,000/pair) and the Minuet Supreme Plus ($699/pair). Silverline Audio was also showing their Grandeur Mk II which retails for $24,000/pair. I enjoyed taking a break for a few minutes and listening to some classic James Taylor tracks on this beautiful system. Scandyna was showing these creative Podspeakers. The speakers support Bluetooth and atpX streaming technology. Velodyne was showing off their vFree headphones which come in a variety of styles to suit your tastes or wardrobe. The speaker covers are removable and you can even create your own personal design. These 1500 watt Class A/B monoblock amplifiers from EMM Labs are $130,000/pair. This is the demo room for Triode Corporation, Acoustic Zen Technologies and Kronos Audio. The demo system used the Kronos Audio Sparta turntable ($21,500) with the Helena tonearm ($6,500). The system was powered by a pair of Triode TRX-M845 monoblock amplifiers which retail for $22,500 each. The system sounded fantastic for what some might consider a more budget friendly (approximately $100K) approach to the high-end audio world. These are the Pari Passu Caprice speakers ($35,000/pair) from Emilai, Inc. The speakers are made in Japan and are covered in hand stitched non-synthetic leather. NAD was showing the new M12 Direct Digital preamp DAC. It retails for $3,499. psb Speakers was showing the Alpha 1-100 sub/sat system which retails for $499. Here is some beautiful gear from LA Audio. 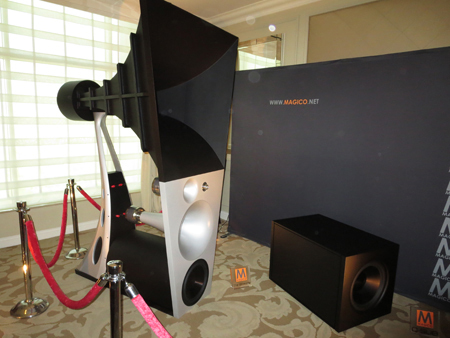 WiSA was showing the latest developments in high-end wireless speakers. 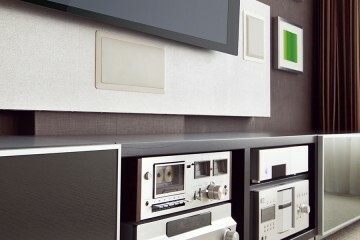 The demo room was using a complete system from Bang & Olufsen. The speakers were BeoLab 17 compact speakers, BeoLab 18 audio columns, and a BeoLab 19 subwoofer. The multi-channel demo was transmitting wirelessly using a transmitter in the Bang & Olufson television. The demo was very convincing and sounded excellent, all without any speaker wires. Here’s the new Astell & Kern AK240 portable media player. It uses a dual Cirrus Logic CS4398 DAC with integrated amplifier. The AK240 supports DSD128 and up to 24-bit/192 kHz PCM audio. It has 256 GB of internal storage and has one microSD card slot. Pricing was not available. McIntosh was showing their new MHA 100 headphone amplifier. It wouldn’t be CES without seeing some of the ultra high-end audio rooms at the Venetian. Magico was showing The Ultimate horn speaker. These enormous speakers are $600,000/pair!! The last stop of the day was a trip to the Hard Rock Hotel and Casino to visit Harmon. As was the case with many companies this year, Harmon decided to consolidate all of their products into one area offsite from the convention center. The show floor was beautiful and gave a great perspective on all the Harmon product areas from automotive to high-end audio. Here’s the Mark Levinson NO 585 2x200W integrated amplifier with DAC. It will be priced at $12,000 and should be available in summer of 2014. The network connection on the rear panel is used for control purposes. This is the Mark Levinson MC-14 Surround Processor. It is a 7.1 channel processor and will be priced at $10,500 with availability in summer of 2014. As I was leaving the Harmon show floor, I spotted Secret’s Editor-in-Chief Dr. John Johnson. That’s it for today. I am off the Las Vegas Convention center tomorrow. As I checked the departure displays at the airport on Monday evening, I was concerned that I might never make it from Cleveland to Las Vegas for the 2014 Consumer Electronic Show. The deep arctic freeze that gripped much of the country earlier this week had cancelled so many flights. After hours of delay, the plane left the subzero temperatures behind and I was finally on my way. It was so nice to walk to the Venetian on Tuesday morning and take in the sights of Vegas under bright blue skies and warm temperatures. The show opened this morning and I spent my day covering the Venetian. Paradigm was showing the Soundscape 42″ five-channel powered soundbar. The Soundscape has three 1″ satin-anodized pure-aluminum dome tweeters and four 4″ polypropylene cone woofers. It has a built-in amplifier which supports 7 channels at 50 watts peak / 25 watts RMS. The Soundscape is $1,499 and should be available this January. Here’s the Soundscape without the grill. 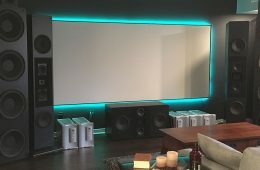 Paradigm was showing the updated Soundtrack 2 System which includes a very thin powered soundbar and wireless subwoofer. The Soundtrack 2 System now includes support for Bluetooth and aptX streaming. The Soundtrack 2 System has one 1″ satin-anodized pure-aluminum dome tweeter and one 4″ composite cone woofer. It has a built-in amplifier which supports 2 channels at 50 watts peak / 25 watts RMS. The Soundtrack 2 System is $899 and should be available in January. Paradigm was showing the updated Millennia CT 2 speaker system. The Millennia CT 2 offers a new onboard control interface, support for Bluetooth and aptX streaming, Dolby Digital and a redesigned remote. The Millennia CT 2 has one 1″ satin-anodized pure-aluminum dome tweeter, one 4″ satin-anodized pure-aluminum cone woofer, a built-in amplifier which supports 2 channels at 40 watts RMS, and a 80 watt RMS subwoofer. The Millennia CT 2 System is $849. An existing Millennia CT system can be upgraded to a CT 2 for $149. Both the CT 2 and the upgrade should be available in February 2014. The new Anthem MRX receivers were on display. They were introduced back in September at CEDIA 2013 and all three models are available now. The second generation MRX receivers offer an enhanced version of Anthem’s Room Correction called ARC 1M and offer support for 4K video upscaling and 4K pass-through. Here’s the rear-panel of the MRX 710 which supports 7 channels. The MRX 710 amplifier is rated at 120 W (2 channels driven) and 90 W (5 channels driven). The MRX 710 retails for $1,999. The MRX 510 is $1,599 and supports 7 channels. The MRX 510 amplifier is rated at 100 W (2 channels driven) and 75 W (5 channels driven). The MRX 310 is $1,199 and supports 5 channels. The MRX 310 amplifier is rated at 80 W (2 channels driven) and 60 W (5 channels driven). Martin Logan was showing the new Crescendo wireless stereo speaker. It supports AirPlay and Bluetooth and uses two Folded Motion tweeters. It is available in gloss black and walnut. The Crescendo is priced at $899.95 and will be available in the first quarter of 2014. Martin Logan was showing a preview of a new Motion speaker with a larger Folded Motion driver. Pricing is estimated in the $3,000 – $3,500 range. GoldenEar Technology was showing their new Triton One flagship speaker. Each Triton One speaker uses a high velocity folded ribbon tweeter, dual cast-basket 5-1/4″ midrange drivers, three 5″ x 9″ quadratic ultra-long throw sub-bass drivers, four 7″ x 10″ quadratic planar infrasonic radiators, and a built-in 1600 watt ForceField Subwoofer amplifier. The Triton One speakers are priced at $2,499.99 each and will be available in the spring. The demo system sounded very nice with a large, detailed soundstage and excellent bass response. I look forward to spending much more time listening to the Triton One speakers in the future. GoldenEar Technology was also showing the SuperCinema 3D Array XL. The 3D Array XL uses interaural crosstalk cancellation to create the performance of discrete speakers. The 3D Array XL uses three high velocity folded ribbon tweeters and eight cast-basket 4-1/2″ midrange drivers. The demo was very convincing and was unique from the perspective that it started with showcasing the stereo performance of the array before moving on to movies. The 3D Array XL is priced at $1,499.99. Tri-Art Audio was showing some of their unique designs. The cabinetry of the products is constructed from bamboo and the product names definitely bring back fond memories of the FlintStones. Here are the Bam Bam mini monitors. They retail for $1,600 for a pair. The Tri-Art Audio Bam Bam mini monitors can be expanded to include a 5″ base box ($1,650 for a pair) as well as a 7″ subwoofer base box ($3,200 for a pair). Here is the beautiful Tri-Art Audio Pebbles turntable. It retails for $1,295. In case you were wondering, Tri-Art Audio makes a complete line of Bam Bam components including a passive pre-amp ($1,295), amplifier ($1,995) and integrated amplifier ($1,750). Bryston was showing their new BUC-1 USB converter. It has an asynchronous USB input that supports up to 192 kHz / 24 bit, outputs for S/PDIF (RCA and BNC), and an AES/EBU XLR output. It retails for $749. Atlantic Technology was showing a new prototype soundbar which made use of small 2″ drivers and their H-PAS bass technology. The soundbar sounded very good in the demo. No news yet on pricing and product name. Arcam was showing their top of the line AVR 750 receiver which has Class G amplification, seven HDMI inputs and support for 4K upscaling and pass-through. The amplifier operates in Class A mode most of the time but can deliver extra power whenever needed for demanding music and movie soundtracks. The AVR 750 amplifier is rated at 120 W (2 channels continuous output) and 100 W (7 channels driven). Arcam was showing this very tiny Bluetooth DAC called miniBlink. It has an audiophile-grade Burr- Brown/TI PCM5102 24-bit DAC and supports aptX streaming technology. It will be available in Q1 2014. ENIGMAcoustics was showing their Sopranino electrostatic super tweeters. The Sopranino is a fully passive design which is intended to extend the high frequency harmonics of an existing speaker. A pair runs $3,690 and comes in an elaborate box. ENIGMAcoustics was also showing their new Mythology M1 compact full-range speakers. The speakers use custom made drivers which are then paired with the Sopranino electrostatic super tweeter. The speakers sounded great in the demo and retail for $15,000 a pair. Stymax International Co. was showing their oBravo HAMT-1 over-ear headphones. Stymax says that the oBravo HAMT-1 headphones are the first to incorporate a folded ribbon tweeter. Venturing back to the Las Vegas Convention Center, there were still 4K/UltraHD displays to see, and more to look at after Day 1. Toshiba has a pair of 4K LCDs available later this year. The L9400 series features a 10-bit panel (from the usual 8-bit) that could allow for smoother gradients, as well as full-array local dimming and a 240Hz refresh rate. While not Dolby Vision, Toshiba says the backlight can provide up to twice the light output of other LED LCD sets. It will be available in 58″ and 65″ sizes this year. The other 4K sets, the L8400, drops the full array LED backlight, 10-bit panel, and only has a 120 Hz refresh. Otherwise the two are practically identical though the L8400 only comes in a 58″ model. 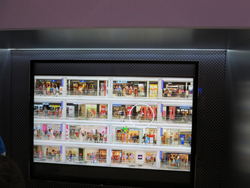 Sharp has a 4K panel that comes in 60″ and 70″ sizes. The Aquos 4K uses a 120 Hz refresh and is THX Certified. Prices are $5,000 and $6,000 and should be available in the spring of 2014. Making my way to the Venetian, I am able to actually extend my arms away from y sides and see the products I am trying to look at. And one of the first stops I made is at Thiel. Their new speaker designer, Mark Mason, received very good reviews for his speakers at SVS and now has new speakers to show off at CES. The TM3 is a two-way bookshelf speaker with a 1″ tweeter and 6.5″ midrange/woofer. When it comes out later this year it will sell for $3,000. Coming soon after is a full range of speakers, including towers, centers, surrounds, and subwoofers. The TT3 shown here is a 4-way, full range tower that will come out this summer. Price on this will be closer to $15,000 with a final number not available right now. There will be a matching 4-way center and more, which should make for a dynamite home theater. In the Paradigm room, Rob Sample was showing off what the updated Anthem Room Correction, ARC1M, can do. Now over Ethernet, instead of a serial connection, you can see all your measurements and results. It makes it much easier to set it up or make changes, and makes the best room correction system out there even better. Paradigm has a new home theater sound bar, the Soundscape is a 5.1 bar that was able to fill the room with bass. It has Bluetooth and multiple digital inputs but no HDMI. There are 3 x 1″ dome tweeters, 4×4″ woofers, and a DSP amplifier. If you want even more bass it includes a wireless transmitter to use with a subwoofer. After hearing what GoldenEar did for $1,400 with the Triton Seven speaker last year at CES, I wondered to myself “What can Sandy Gross do if he sold a speaker for $5,000 or $10,000?” Well, I found out with the new $5,000 Triton One. Now with far more powerful amplifiers, more bass units, and an improved crossover, it has no trouble filling the room at the Venetian. The only downside is that the review sample will be going to someone other than me, as I’d love to hear them sing in my own basement. A pleasant surprise was the performance of the Dynaudio Excite X34. Powered by an Octave Tube Integrated and playing from a MacBook, the bass these speakers produced was really incredible. Listening to “Royals” by Lorde, I heard the song sound far, far better than I had ever heard it sound before. It was also nice to hear someone use more modern music than the usual standards, and that the music held up well with such a nice system. SVS had a pair of new 12″ subwoofers to show off. The SB-2000 and PB-2000 each feature a 12″ driver and 500 watt amplifier. 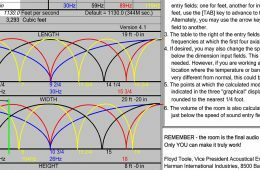 They had to go back and design a new 12″ driver to be able to handle the amplifier at full power, and said they should easily best their previous 12″ designs at this price. The sealed model lists for $699 while the ported box, which is massive in size, sells for $799. Sony had a room at the Venetian with their new media server and integrated amplifier. The media server has a 1 TB hard drive and can play back everything from 24/192 to Double DSD. It can also convert everything to DSD during playback if you want, but that can be disabled for the purists like myself. The integrated amplifier manages 80 watts per channel into two channels and is biased towards Class A. Both can be connected with a cable and then the combination can be controlled by iOS or Android apps. Sorry, no Windows Phone app. Across the room was something very cool: A custom pair of amplifier for Sony’s reference loudspeakers designed by Nelson Pass. He went out and found a whole lot of Sony’s JFETs from 40 years ago to create this pair of custom amplifiers. You won’t be able to buy these, as they’re a special pair for Sony alone, but they sounded wonderful playing back Beck’s “Sea Change” in high resolution. Meridian has their recently released Prime headphone amplifier available for listening. Powering a pair of Audeze headphones it has no issues with volume on them, even with their demanding loads. It has an analog filter that can introduce a slight bit of crosstalk into the signal to provide a more stereo-like image. Turning it on moved the soundstage from the sides of my head to slightly in front and was a bit more enjoyable to listen to. Martin Logan had a final version of the Credenza tabletop system that was shown in an early form at CEDIA. With two of their folded-motion tweeters and a fairly substantial mid/bass driver it can put out a good-sized sound. Listening to “Reckoner” from Radiohead (good choice on music guys!) the sound is large and clear. You can add an external subwoofer if you would like to as well. It features Airplay, Bluetooth, and will be $899 when it is released in the next couple months. Martin Logan also had their Balanced Force subwoofers on display. Here is a 212 model with dual 12″ opposed woofers and a clear top. They won’t ship it with a clear top, as you wouldn’t be able to see anything anyway with the internal sound damping in place. The theme of CES 2014 this year is fitness gadgets. They are everywhere in the convention center. But we don’t care, so we’ll focus on TVs instead. If you announced a TV this year, there is a good chance it was a UHD model. UltraHD is everywhere this year and content is following along. Netflix, Amazon, and others are promising streaming 4K this fall using HEVC or VP9 for better compression. There is no announcement for physical media, other than the media server from Sony that only works with their displays. Sony is out with new UltraHD models, with the X950B topping the line. These are rear array LED models that should offer better contrast ratios and black levels than edge-lit sets. Only available in a 65″ and 85″ sizes, release dates and prices are not known yet. The stand design is very nice with the cables going up the legs to be totally hidden. The cheaper X900B UltraHD sets are edge-lit and have the side speakers that Sony introduced last year. These also feature extended dynamic range through backlight control, though in the demo scenes they had up I could notice a fair bit of blooming around bright objects. Available in the spring, price TBA as many displays here are. Blu-ray players are still around, but not as big a deal as they were before. Sony updated theirs with the BDP-S6200 and BDP-S5200. The higher end model adds 4K scaling, likely making it a replacement for the BDP-S790. Sony is making a push for high-resolution audio at CES as well. They are now shipping a new integrated amplifier that produces 80 watts per channel and retails for $2,000. More details weren’t available to me, but I’m hoping it will be available to listen to when I make it to the Venetian on Thursday. Going along with the high-resolution audio push is the updated version of Sony’s 1040 receiver, the STR-DN1050. No prices or details were available beyond the fact that it will support native DSD playback. 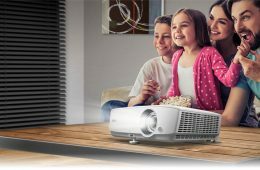 BenQ has updated their W7000 projector, reviewed here before, to the W7500. The new model replaces the DarkChip2 with a DarkChip3 that offers improved contrast ratios and still provides 2,000 lumens. It also has ISF modes for calibration and retails for $2,799. Another theme at CES is people trying to take over multi-room audio from Sonos. Samsung has expanded their new Shape line of wireless audio to support 5.1 channel setups like Sonos can do. It uses a WiFi mesh network so how well it performs compared to Sonos, which uses it’s own wireless network, will have to be seen. The Shape M7 is available now at $400 a speaker. LG also has their own version, the NB8740, though it supports 24/192 audio while most do not. It also offers a line-input so you can use it with your TV instead of a sound bar if you like. Having used Sonos for a while, how well these succeed will really be more about software than hardware so we will need to test it when they come out. A big product that we got to see early is the Oppo Planar Magnetic headphones and amplifier. The headphones are very comfortable to wear, with lambskin pads and a much lighter design than other models. Extended listening sessions with these should not be hard to pull off as they feel great on the head. The headphone amplifier is much further along than when I saw it last year, with the screen in place and all the inputs working. It supports 24/192 audio as well as native DSD and has a gain selection on the back for your headphones. The interface is clean and easy to use, and it played back FLAC and mp3 files from my iPhone through the front USB port easily. Both will hopefully be available soon, with pricing yet TBA. OLED is everywhere, but most of the sets are still prototypes or without details, and curved. They’re all curved. It seems they are doing this just because they can, but hopefully someone releases a flat one this year. LG even has OLED sets in the press room that just play CNN or ESPN all day and they look fantastic. I just wish they were flat. A pair of companies, TCL and HiSense, are integrating Roku into some of their TVs this year. Since Roku is still so much better than all the other integrated streaming solutions, this is a nice change to see. For a secondary TV one with Roku built in would be a big feature for me to look for. These aren’t out until later this year, and I couldn’t get details on pricing yet, but perhaps some other vendors will start to offer this as well. Toshiba went past 4K with a 5K set that is 21:9 in size. 5160×2160 resolution makes it ideal for watching movies shot in scope format. The updated HDMI specification even includes support for 21:9 content, though manufacturers will have to start making that for it to look ideal. This seems to just be a prototype and not something we will be seeing at stores in the future, but it looked really nice. Sharp is showing off HD sets using something called Quattron+ that adds additional sub-pixels for higher resolution. The exact make-up of the array isn’t something they talked about so I’ll be curious to see what the design is. Images on them looked good, though I rarely trust content on the show floor as it’s so tightly controlled. Since Quattron is a bit of a debatable feature, I’m not certain how this will perform but I look forward to seeing it. These sets start at $3,000 for the 60″ up to $6,000 for the 80″. Sharp also is showing their own set using the Dolby Vision HDR technology like Vizio is. It is running the same demo loop that all the sets do, but it never stops looking bad. The crowd around the set made it impossible to grab a good photo of it, but it looks great. The day before CES opens is a mob scene of gigantic press conferences as members of the media move from ballroom to ballroom. So I skipped it and instead went to see what Vizio had to offer in their off-site demo room. Vizio is bucking the tide a bit this year and eschewing two things that everyone else loves: being thin and 3D. Instead of shaving off another fraction of an inch on their TVs to try to be even smaller, they have moved all their TVs to rear-array LED lighting systems this year. They are now designing their own backlighting system instead of buying them from someone else and have more control over the design of everything. The budget E-series, which ranges from 22″ to 80″, now has LED rear array lighting on every set over 29″ in size. Every TV is also available in a smart version, even the 22″ one, which is a change from before. The number of lighting zones varies as you move up in size with 16 on the largest sets and only a handful on the smaller ones. While rear array lighting adds a bit of thickness to sets, they’re still very thin and it should provide more uniform lighting and better black levels. The step-up M-series also has rear array lighting with 32 zones on every size except for the 32″ model (which has five). The M-series, and the other Vizio models, have a redesigned Apps model that lets developers leverage HTML 5 for their apps. Since HTML 5 is used for a lot of computer, smartphone and tablet apps now, this makes it much easier to port apps over. This should let Vizio get app updates faster, and have a larger selection of apps to choose from as well. While Vizio showed a 4K proof-of-concept last year, it was never released. 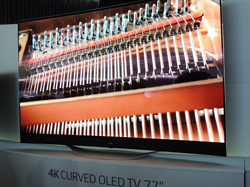 This year they have 50″, 55″, 60″, 65″ and 70″ UltraHD TVs for release later in the year. The P-series offers 64-zones of LED backlights, HDMI 2.0 inputs, 4K streaming support with Netflix, and hardware accelerated HEVC decoding. Ship dates and price are still to come on these. The big news is their Reference Series sets. Using high dynamic range technology from Dolby, these sets can produce up to 800 nits while still maintaining low black levels, thanks to 384 LED zones, that allows for enormous contrast ratios. What really helps them stand out is support for more of the Rec. 2020 standard including a much larger color gamut. Using content from Dolby for this, compared to a standard UltraHD set from Samsung, the colors more saturated and vivid on the Vizio. Not a fake, badly setup TV vivid, but producing richer reds and blues that the current HDTV color space can not support. Watching Star Trek the uniforms would be a different shade while other tones were the same as they were supposed to be. The highlights are almost too bright at times, but the black levels still did well. The two models, 65″ and 120″, are still works in progress and some scaling and dynamic lighting issues could be seen. Last week Vizio sent people from RED to the Rose Bowl (which Vizio sponsors) with 4K cameras to capture footage of the game. Displayed on the 120″ Reference monitor this simply looked stunning. People are life size, or larger, and the detail you can make out is incredible. The Reference Series sets come with an included base and wireless sub for true 5.1 audio, but can be displayed on their own if you have a separate sound system. This is really why Rec. 2020 excites me, not for the extra resolution, but the greater color gamut and bit depth it offers over HDTV. Mark O’Brien brought his exceptional new Pharaoh integrated amplifier, 175 watts into 8 ohms, it also has a phono preamplifier for both MM/MC cartridges. At $3,495 it may be the last integrated you ever buy! Partnered with Dynaudio speakers, the sound was exceptional, clean through and through. Meridian has introduced a Special Edition loudspeaker celebrating their 25 year success as a DSP active speaker maker. The cut away shows the multi-layered plywood with an layer of aluminum. New is a beryllium domed tweeter, and drivers with a clamp ring further fixing the driver to the frame. Although Meridian makes powered speakers, they introduced two new amplifiers as well in the G55 and G57 to compliment the new HD621 processor. The impressive sounding Nico, a stand mounted 2-way speaker featuring a new EgglestonWorks tweeter and 6″ driver. Very elegant in a variety of colors. I’m partial to any speaker named Emma, this very reasonably priced floor-standing is priced at $3,950 for the pair. Similar styling to the Nico it boasts dual 6″ drivers for more bass extension. I think a number of us will want to take home the new turntable RP10 from Rega. The RP10 design is based on a “skeleton” frame, rigid mass and stiff plinth. A “closed-cell, nitrogen-foamed polyolefin core retained in a stressed phenolic skin” is how it is explained. It includes the beautifully machined, one-piece RB2000 tonearm. $5,495 will get you the table and adding the cartridge that normally sells on its own for $1,795 adds only a grand to the RP10! I may have to arm wrestle JJ to get it for review, I will start pushups this weekend. Also shown are the new Rega top-loaded Saturn-R CD/DAC player and Ellict-R integrated amp. The Saturn-R as a transport will take your high-res downloads and play back with Wolfson DAC’s up to 24bit/192kHz with an asynchronous USB input. $2,995 for either. Conservative in design, the flagship $19,000 Fact 12 embodies the spirit of PMC’s studio monitor roots only for the home. I found the sound clean and detailed. The most dramatic bass I heard from such a modest-sized speaker was Dynaudio’s Excite speaker. Introduced last year, it gave such punchy bass that it was felt in your gut. Powered by the V-110 Octave integrated amp, I was impressed. I love the styling of the new NAD Master Series M27, 7-channel power amp and especially the M17 A/V preamplifier at $3,999 and $5,499 respectively. Although just a preview, no other information was available although at this time. A new company in the Lenbrook family, I had heard the new smartly designed series called Bluesound in Manhattan a few months back. Give credit to David Farrage for the amazing industrial design and the Lenbrook people for the concept. A lifestyle series notwithstanding, it addresses the new direction in home audio. Burn and store CD’s with the Vault, stream with the hi-res DAC with the Powernode amplifier, or listen to the Pulse anywhere. In Center Hall of the convention center I came across a great demo with the Klipsch Palladium Series, which is rare considering the ambient noise in the hall. The Bluetooth enabled P-38F floor speakers and P-312W powered subwoofer offered an excellent playback. What made it more interesting was that it was being fed wirelessly by the new WiSA compliant Sharp SD-WH1000U Blueray player, no audio or video cables to either the speakers or monitor! The player will be pricey at $4,000 and requires the bridge at $600 for non-equipped wireless speakers and amps. Still very cool. I was drawn to the Synergistic Research room because I wanted to see and hear the Rogue Audio soon to be released new version of the Apollo monoblock amps and was completely impressed by the sound and demo. Synergistic was auditioning their tweaks that had me baffled, I was hearing a difference with the active gear off and on although to me subtle. Adorning the room was Acoustic Art treatment, HRT and of course their cables, and FEQ and HFT line conditioners. I can’t argue with the sound of the room, it was one of the best in the entire show. Stopped in next door, (well next door in Vegas is a mile) to see T.H.E. audio show and managed to hear a couple of nice demos, the most striking was from Nevada based Perla Audio that designs and builds everything on display from the Signature 50 integrated amp at $9,000 and the PRS-2 and PRS-2B at $7,800 and $8,800 respectively. It was impressive from the positioning of the chairs, up and close for the near field experience. Superb clarity and definition! The audio side of CES is essentially the Venetian hotel, several ballroom but mostly the upper floors of the tower rooms. I can’t tell you how pleasant that is, to avoid the convention center all together. The weather has caused some loss in attendance for the first day, especially from those coming from the east coast. I know this frankly from the fact that I can almost take an elevator up to the Venetian tower floors whenever I want. Despite the lack of bodies, I give credit to the exhibitors who have to endure, hopefully the latecomers will fill in the rest of the week for them. Coming off my review of the CS2.7 floor standing speakers which I loved, I was interested in seeing the new line including the TM3 monitor at just under $3,000 for the pair, stands extra. I was impressed by the elegant design, quite modern in fact. The pedigree is there, sloped curved sides, 2-way tweeter/ 6.5″ woofer but rated at 8 Ohms, a bit unusual for THIElL, perhaps easier to drive? In the line was also the replacement for the flagship CS 3.7 in the TT3, beautifully shown in gloss white, again unusual for THIEL. Not much info yet, but very cool! Unusual to see Martin Logan powered by tube amps, specifically the Rogue Audio mono block M-150, ($5,995 for the pair). The room was set up in surround sound with five ML Montis electrostatic , 3 in the front alone ($9,995 for a pair). The rear pair was powered by Rogue Audio’s ST-100 stereo amp. Also included were a pair of ML’s new Balanced Force subs ($3,995 each) with two 12″ woofers each. It was great to hear music surround from The Flaming Lips, the Rogue Audio amps provided ample power and the Martin Logan’s provided delicate and airy sound. I’m always charmed to run into Richard Schram of Parasound. Inevitably we do discuss audio but he’s just fun to chat about life. I currently am reviewing his new P5 preamp and it was on hand along with the revised JC3+ phono preamp. It adds a new power supply, independent load adjustments for MC cartridges and modified circuit board. Playing however is the CD 1, the JC2 preamp, and JC1 monoblocks. They’ve partnered up with KEF before and on hand were KEF Reference 207/2 for an excellent sounding system. It was good to see and hear James Tanner’s Bryston Middle T ($4,500 for the pair) full range speakers in an elegant natural cherry vinyl veneer. The 4 Ohm speakers were powered by Bryston’s 28BSST amps, and digital sources from the BDA-2 and BDP-2 digital player. The new Middle T features two 8″ woofers with the 5.25″ mid-range and 1″ tweeter. I also liked the out-rigger adjustable spiked feet. I will honestly say, this is the best sounding Bryston speaker to date. Tremendous depth, rich and transparent. The room offered a wide soundstage. Very worthy of consideration for one of the best speakers I’ve heard today. Stunningly rendered music from a modest-sized system, the new Kin compact sub features an 8″ driver and 150 watts. Accompanied by a stand mounted pair, the package is worth about $1,500 (hope I got that right). They both featured slightly sloped fronts as Vince Bruzzese, founder and chief designer moved the small monitor around showing me how the flexible the location can be. The soundstage didn’t change. It was one of those packages that made me want one. Never, ever disappointed by hearing either the YG speakers or gear from D’Agostino Design. Both beautiful in appearance, YG had their new Hailey 1.2 speakers accompanied by the D’Agostino Momentum amps. Wow, the Grand Tower from Usher is impressive physically and sonically. It features three separate compartments or cabinets, stacked precisely. The 3-way speaker stands almost 7 feet high. I didn’t bother asking the price, just listened. As great as the full-range S-3 sounded, (starting around $22,000 per pair) I was drawn to the neighboring room where the static display of the Ultimate III triple-horn loaded speaker was roped off for viewing only. Wow! What a piece of art, and happily noticed it displayed a made in the USA etching on the rear aluminum brace. At $600,000 for the pair, I was envious of the industrial designer, a tour de force. A beautiful lifestyle piece from acclaimed DALI in the Kubik Series. It’s available either passive or active and can also incorporate a powered subwoofer. Bluetooth, USB, optical and analog connections offer flexibility. Revealing the drivers it features the classic DALI wood fiber driver. A variety of colors too! Nice to see some fun in the concept here. The active version is $1,295, passive at $695 and Sub 1 at $595. 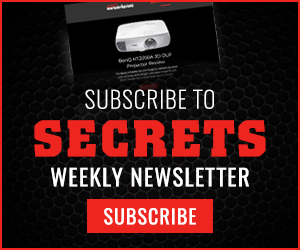 I was more than impressed by the Ultra speaker package from SVS and their new 200 Series subwoofers. Several demos including opera and movies, it was great to see a value based performance package amongst the expensive rooms around SVS. The new subs include SB and PB-2000 and $699 and $799, featuring 12″ drivers. the Ultra speakers included floor standing, a center channel and interesting Ultra surrounds that can operate as both surrounds and rears with a second set of speaker wires. The combination was under $3,800 al inclusive. I’m getting tired of repeating the mantra about GoldenEar, they’ve done it again! As we scale up the Triton ladder, presented is Triton One, the largest of the line, well to date anyway. Tall at 54″, it boasts a 1600 watt class D amplifier for three sub-bass drivers on the front, balanced with two large 7″ x 10″ planar radiators on the side. The HVFR tweeter is arranged with two 5 1/4″ drivers. This is such a well-balanced speaker, smooth, clean and frankly effortlessly sweet with full-bodied bass. Now think about the price at $2,499.99 each, makes the Triton One not just one of the best values at the show but one of the best sounding, no exaggeration. Think I’ll grab a box lunch in the press room…..
Mark Levinson’s beautiful new integrated the 585 is almost here. Martin Logan’s impressive sounding new Motion speakers. A new headphone amp from Meridian featuring full USB DAC and optional power source. Peachtree had a lovely new integrated that fits in nicely below its top of the line Grand. The new Nova 220SE ($2000). Sony is all set to release its new high end digital music player. This is not a streaming device. It only plays music back from a local hard drive. Also offers DDSD. They had it playing on their top of the line speakers powered by custom amps made by Nelson Pass. Amps that none of us will ever be able to purchase. Velodyne has a new set of active wear vFit ear buds available in red pink and blue. And finally a shot of Robert and Cynthia sharing a laugh, probably at my expense. On this day two of the 2014 CES show I visited the glorious central hall, home of all the big electronics companies. As you enter you are greeted by Hisense and immediately the theme of the show, 4K. Their TV’s looked like all the rest and unfortunately that’s what I really came away with: all the TV’s look the same! Custom 4K footage that looks good but its not like we will have a quality 4K source any time soon. Even the portable camera market is embracing 4K. GoPro can record 4K resolution now but the compression is so bad that it is totally pointless. The LG booth was plastered with both 4k LCD and OLED displays. I’m not quite sure the reason behind making them curved but LG seemed to think that was a great idea. Sure everything looked good but they will be expensive for at least a few more years so it’s hard to get too excited about. I just wasn’t all that impressed with anything on the floor. The top two Korean companies love to compete against each other which promotes innovation but also a lot of copying. If you took away the branding in the LG and Samsung booths, you would have essentially the same exact products. Cellphones, tablets, kitchen appliances, OLED/LCD, and computer monitors. Not one set really stood out as the best. The Sony booth was pretty much the same as last year. New versions of the same LCD TVs along with the same spread of Sony gear. The Soccer footage promoting the filming of this years World Cup in 4K certainly looked tasty though. I’m pretty sure the Toshiba booth was even smaller this year and I get the feeling they may not even be around in a few years. Their 21:9 set looked very good though. Not that most of us could even afford it. You know its expensive when they don’t list prices! Same stuff, so uninspiring! This photo is of an 8K 3D set that didn’t require glasses. It uses the same tech that requires each viewer to be in an exact spot. Moving your head even the slightest creates tons of distracting artifacts. It’s essentially unwatchable. I’m still angry Panasonic pulled the plug on plasma. There was nothing there to ease the pain. NAD D 1050 USB DAC headphone amp for $499 has been out for several months but expect a review soon. Love the styling. The wonderful HiFiMAN was showing off new planar magnetic headphones! The HiFiMAN HE400i and HE560 now have a new Advanced Single End Planar Driver. This new driver allows for vastly lighter, 12oz, design. Also a beautiful Teakwood Earcup. 90db efficiency, 35 ohm and coming in March 2014. The most exciting products I saw at the show and I can’t wait or get my hands and ears on them. CES 2014 marks my 5th trip to this illustrious show. The theme this year is 4K and 3D printing. I like 4K and feel it will eventually be a reality with a proper 4K source delivering pristine picture quality, but right now it’s just a dream. Most of the 4K sets don’t look any better than 1080p sets with today’s available 1080p content. There really isn’t any compelling reason to upgrade today just for resolution. I think that is why Dolby is taking a different direction towards improving the viewing experience with its HDR demo (which Chris has more info on). Having a wider color gamut and dynamic range with 12bits per pixel instead of 8 allows for images that really stand out in the crowd. I spent day one covering the South Hall of the Las Vegas Convention Center which means mostly headphone coverage. 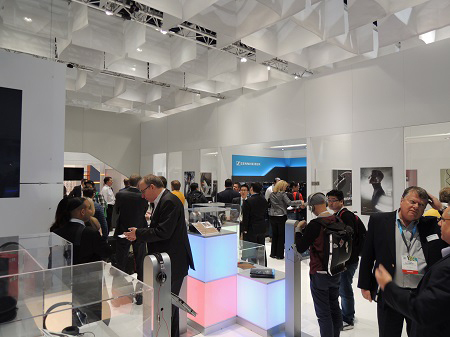 Over at the newly designed Sennheiser booth, they were showing off a new, smaller on-ear Momentum headphone. Available in several stylish colors, this is sure to be a solid seller. A new style for the full size around-ear Momentum’s is also on its way. It looked very classy!! Sennheiser was also introducing its new DJ line-up of headphones. The ears pivot around allowing for multiple ways of positioning the headphones while DJ’ing. Last up they were showing off their entry into the gaming headset market with the new G4ME ONE headset. The units felt comfortable and include a nice feature to mute the mic when pushed up away from your mouth. G4ME ONE headsets are even PS4 compatible! Creative was showing off the SoundBlasterROAR, or what they refer to as an Audiophile Sound Booklet. TheBooklet term is in reference to its book-like size. It was hard to hear the quality in the massive convention center, but it could definitely play loud for its size. Also has a battery for portability. Quickly off topic because it was so bizarre.. A company was advertising a new kind of tooth brush or lip massager? It was very weird. Back on topic! Star Wars branded and colorful headphones from SMS – 50 Cent’s headphone company. Also, FIDDY CENT! These are not what I call audiophile headphones.. Turtle Beach (gaming headsets) was showing off the only headphones fit for a giant. Polk Audio was demonstrating its new Xbox headsets and sound bar. These were designed to work specifically with the Xbox 360 and new Xbox One. They also have new earbuds, the high-end Nue Voe and the intro Nue Era. The Buckle on-ear headphones with some pretty stitching were also there. The Westone booth was quite creative with their presentation. They had a live band playing, but you could only hear the amplified sound through their professional and consumer earphones. The pro line was a bit too hot for my ears, but the consumer model sounded terrific. That’s the new W line that features up to 6 drivers in the W60 model! Looking forward to getting some in for review to let you know how they really sound. Next up was the German headphone company Beyerdynamic. They had a new compact on ear model, T51p, that sounded pretty good, along with a small portable amp the A 200p. They were also showing off the customizable Custom One Pro and some new in-ears the DX 160iE. The DX 160 iE sounded a tad bright to me. And to close for today.. SAD CLOWNS.